The weather has been nice the last couple of days. For a winter season, the temperature is above normal. But hubby told me that there's a cold front coming tonight so we will be in the 20's tonight. I don't like it when it's too cold. It makes my hands and feet cold too. It's good we don't have snow here in Texas. Only once in a while but still the temperature is cold. 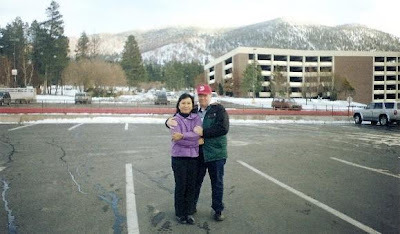 I remember when hubby and I went to North Lake Tahoe, NV more than four years ago. It was snowing at that time and oh my, it made me shiver. The view was nice though especially those mountains covered with snow. Here's one of our photos.